Here I show delicate and thin foliates, made of local flint (max. length: 6,5 cm), found in Tunisia near Gafsa nearly 100 years ago. They do not resemble the local Neolithic and are most probably part of a differentiated local MSA. Near the Algerian border, Northwest of Gafsa (Tunisia), a surface industry containing mainly bifacial tools was detected and described early during the 20th century. 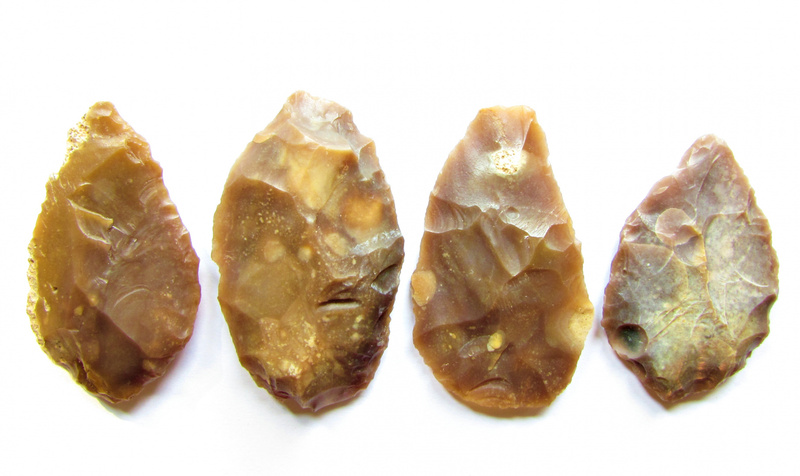 The bifaces of this industry, which is also known from surface scatters in Algeria, range from asymmetric and thick foliates to finely symmetric “Solutrean” like Leaf points. The term Sbaikian for such assemblages was subsequently coined. During the 1920ies and 1930ies the Sbaikian played a prominent role in the discussion about the roots of the West European Solutrean. After the 1950ies such ensembles were forgotten, mainly because not a single in-situ site was found and excavated. In addition it became clear that the Solutrean had no African roots. During the last years and within the framework of renewed examination of the N-African MSA, the Sbaikian was reintroduced into the discourse again- now as a “Lupemban-like” industry with foliates and the occasional presence of core axes. Sorry-there is nearly no digitalized literature about the S’baikian but after the scientific recognition of the forgotten ensembles I hope that this will change within the near future.